The largest and most affordable Online Roof Wheel Carriers Shop! Roof Wheel Carriers shop the largest and most affordable! Do you want to buy a Roof Wheel Carrier online? 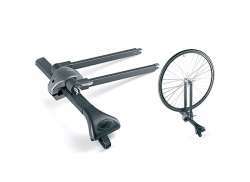 Hollandbikeshop.com has the Roof Wheel Carrier you're looking for. With some bicycle carriers it is necessary to take the front wheel out of the frame, and sometimes you just want to take an extra wheel or set of wheels with you. In those situations a roof wheel carrier is perfect for you. The wheels won't be sliding around in the trunk and your trunk will be free to store other items in. At Hollandbikeshop.com you can find a wide choice of Roof Wheel Carriers by brands like Atera, Elite and Thule. In our wide Roof Wheel Carrier range on Hollandbikeshop.com, you can find Roof Wheel Carriers in various colors, sizes and models, like wheel carriers with theft protection. So you'll surely find the Wheel Carriers for the Roof you're looking for. Hollandbikeshop.com is dealer of Wheel Carriers for the Roof and has a large and affordable range. We also often have Roof Wheel Carriers on sale or in our outlet, so keep an eye on our sale button. The largest and most affordable online Roof Wheel Carrier!